Amblyopia is a unique eye disease that is also referred to as “Lazy eye” and affects 1-5% of the global population. Get detailed information about this disease, including its causes, symptoms, diagnosis, and treatment options. It is an ocular disorder that is characterized by the loss of ability of one eye of a person to view details of the images that it sees. In children, it is regarded as the most common visual problem. The possibility of development of this condition in adulthood is rare. The ICD 9 Code for this disorder is 368.0. As aforesaid, the disorder affects 1-5% of the population of the world. It is more common that you think. Around 1 in 25 children develop the disorder to a certain degree. It is the most common condition treated by ophthalmologists and orthoptists. It is characterized by a misalignment of the eyes. This type of “Lazy eye” usually leads to a normal vision in one eye but an abnormal vision in the affected/wandering eye. This happens as a result of the difference of images projected to the brain from the two eyes. In adults, an onset of the disease generally leads to Diplopia (double vision) as the focus of the two eyes do not fixate on the same object. The brain of children are more neuroplastic and can adapt more easily to the problem by suppressing images from the one of the eyes and thus prevents duality of vision. It may arise as a result of Anisometropia or a difference in refractive error between the eyes. The problem exists when there is dissimilarity in the refraction between the eyes of an individual. The eye that renders clearer image to the brain becomes the dominant one. Due to the blurriness of the image in the other eye, there is abnormality in development of one half of the visual system. Refractive Amblyopia is typically less severe than the Strabismic form of the disorder. It is usually overlooked by primary health care providers due to its reduced prominence and absence of apparent physical symptoms, such as those occurring in the Strabismic type. Amblyopia is often associated with a combination of the Strabismic and Anisometropic forms. In some sufferers, there can be as severe a vision difference between the eyes as to result in twice the average vision in one eye and total blindness in the other. It occurs when the ocular media turns opaque, as happens in case of corneal scarring due to trauma from use of forceps at the time of delivery or due to a congenital cataract. The opacities in ocular media prevent transmission of adequate visual input to the eye. Unless treated in time, the condition may continue to persist even after the underlying factor for the opacity has been removed. In some cases, Ptosis (droopy eyelid) or some other ocular problem may lead to occlusion of vision (of a child) by the upper eyelid. This may quickly result in Amblyopia. This subtype may also be a complication of a Hemangioma that obstructs the eye partly or in its entirety. In mild cases of the disease, patients do not have a proper sense of depth while looking at objects. The three-dimensional effect of image-perception is missing in such people. Sufferers experience some difficulties in carrying out some tasks in the absence of good vision in one eye. With proper vision in only one eye, there is risk of acute vision problems if the patient develops disorders in the normal eye or injures it in some way at a later time. In permanent Amblyopia, patients fail to see accurately with one eye. The severity of visual impairment may differ. Although patients can manage vision with one eye, it is always better to have another for proper viewing of objects and having visual perception in totality. Although this disease affects only one eye of a person, there is a possibility that both eyes may suffer due to it. The condition typically arises when there is a lack of development of the pathway of nerve from one eye to the brain during childhood. This happens as the affected eye sends a wrong image or blurred image to the brain of the sufferer. This makes the signals confusing for the brain which chooses to ignore the image that it receives from the affected eye. It is a condition marked by an abnormal alignment of one or both eyes. It arises due to impaired balance in the muscles that are responsible for the positioning of the eyes. This imbalance may force the eyes to turn out or get crossed. A muscular imbalance prevents the eyes from tracking with each other in a coordinated manner. Strabismus is the most common cause of Amblyopia. 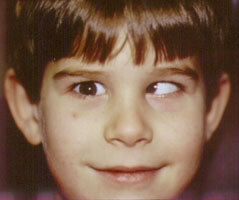 However, the disorder may arise even in the absence of Strabismus. Similarly, people are found to suffer from Strabismus without having “Lazy Eye”. It may also arise due to hereditary factors as sufferers of the disorder are often found to have a family history of it. In rare cases, an underlying ocular tumor may lead to wandering eyes – which arises as a first sign of a timorous growth in the eye. In some cases, “lazy eye” is the direct consequence of an ocular abnormality – such as abnormalities in the central retina or a cataract (cloudiness in the eye lens). In other cases, the condition develops due to difference in size between the eyes or abnormalities in eye shape. The diagnosis of this condition is generally easy. It is usually detected with the help of a complete examination of the eyes. Usually, special medical exams are not essential. Doctors usually look for a visual difference between the eyes or impaired vision in both eyes of a sufferer. A vision assessment, as a part of the physical examination, should be conducted. The eyelids and the eyes should be carefully inspected to detect signs of other ocular issues such as cataracts, corneal lesions or Ptosis. Red reflex and extra-ocular movements should be carefully examined. In cases where vision does not fully recover in children, or if they have only one functional eye (due to the other being damaged as a result of some other condition), glasses fitted with protective polycarbonate lenses should be worn. Polycarbonate glasses are scratch as well as shatter-proof. In some cases, eye wears alone are enough to correct the condition. A patch is positioned on the weak eye to compel the brain to receive and recognize images from it. In some cases, drops are used instead of patches to blur the vision of the healthy eye to force the brain to take the mages rendered by the weakened eye seriously. A daily or twice-a-week administration of a drug known as Atropine can temporarily cause blurring of vision in the healthy eye. This helps complete development of the area of the brain that controls vision. The eye muscles of a child need to be surgically repaired if he or she is found to have eyes that are crossed or outwardly developed. Any ocular condition, such as cataracts or droopy eyelids, that gives rise to poor vision in the affected eye also needs to be treated through operative procedures. The outcome of the condition is generally good. Children who receive proper treatment before the age of 5 are usually found to recover their vision almost completely. However, they may continue to suffer from difficulties in perceiving depth of objects. In most children affected with this syndrome, accurate treatment helps improve vision within a span of a few weeks to a few months. Although research shows the treatment is possible through at least 17 years of age, it is better to initiate cure in the early stages of childhood. The earlier treatment is initiated, the better it is for sufferers. A delay in treatment can lead to permanent problems in vision. After a sufferer has become over 10 years old, the disorder can only be partially reversed. According to the National Eye Institute, “Lazy Eye” is the most common case of vision impairment in a single eye in young as well as middle-aged adults. When left untreated, the brain pays little attention to the images transmitted by the weakened eye. Gradually, the eye becomes virtually non-functional and the condition becomes permanent. It becomes quite difficult to treat the disorder at this juncture. If attempts at improving vision become unsuccessful, the quality of life of patients may be affected in an adverse fashion. The loss of stereoscopic vision would make patients incapable of perceiving depth of objects and make them susceptible to life-threatening injuries. In the absence of treatment in time, bilateral vision loss may occur due to damage to the normal eye. Permanent loss of vision associated with this disorder may be avoided through early diagnosis and treatment of Amblyopia. It is necessary to conduct a complete ocular examination at least once before they are over 5 years of age. Specific techniques are required to assess visual acuity in kids who are too young to describe their condition. These techniques can be performed by the majority of eye care professionals. Take a look at these images to know how the condition affects the eyes of its sufferers. If your child is too young and you suspect vision problems (suggestive of Ambyopia, such as wandering eyes) in him/her at any time after the first few weeks of life, get in touch with an ophthalmologist or an eye care professional to diagnose and cure this condition on an immediate basis. As aforesaid, early treatment is the key to cure this disorder. The faster you seek treatment, the higher is the chance of reversing the condition completely. Facts about amblyopia. The National Eye Institute. http://www.nei.nih.gov/health/amblyopia/amblyopia_guide.asp. Accessed Sept. 27, 2010. Olitsky SE, Hug D, Smith LP. Disorders of vision. In: Kliegman RM, Behrman RE, Jenson HB, Stanton BF, eds. Nelson Textbook of Pediatrics. 18th ed. Philadelphia, Pa: Saunders Elsevier; 2007:chap 620.